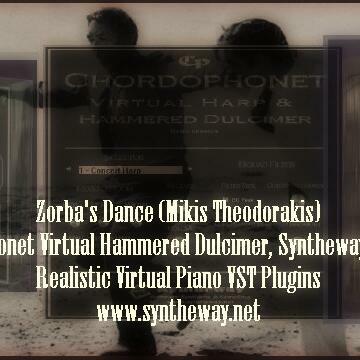 Note: " #Zorbas " or more commonly, "Zorba's Dance" is a song by Greek composer #Mikis #Theodorakis. It is based on two traditional Cretan songs, "Armenohorianos Syrtos" and "Kritiko syrtaki", composed by Giorgis Koutsourelis. The song featured in the 1964 film #Zorba the Greek, for which Theodorakis wrote the soundtrack, and became popular around the world. It is now commonly played and danced to in #Greek tavernas. The track has been recorded by many different musicians from around the world. 1) Chordophonet: Is a Virtual #Harp and #Hammered Dulcimer sample based software instrument, featuring Celtic and Concert Harps, Pre-recorded Harp Glissando and Upward-Downward Harp Glissando, and #Hammered #Dulcimer modes. 2) Realistic Virtual Piano: Is a acoustic grand piano emulation based on a Acoustic #Kawai and #Yamaha #GrandPianos. 3) Syntheway Strings: Is a sample based string VST instrument with multisampled #Ensemble #Strings: #Violin, #Viola, #Cello & #DoubleBass instruments. Windows Operating System : Windows XP, Windows Vista, Windows 7, Windows 8, Windows 8.1, #Windows10 / x86 (32 bit). AU / VST Hosts: #LogicProX, #GarageBand, Final Cut Pro X, MainStage, #Cubase, #Ardour, #AbletonLive, #REAPER and #DigitalPerformer OS: Apple Mac OS X v10.6 "Snow Leopard", Mac OS X v10.7 "Lion", #Mac #OSX v10.8 "Mountain Lion", Mac OS X v10.9 "Mavericks", Mac OS X v10.10 " #Yosemite ".